Previously known as VectorOpenStock, Vexels still features thousands of free vector graphics and designs, organised into easy-to-browse categories. Its new selling point, though, is an online editor that enables you to customise vector designs in the browser, customising layouts, adding new elements and changing things like colours and text, so they're ready to go as soon as you download them. Crammed with thousands of free vectors and much more besides, including Photoshop actions and brushes, photography and fonts, Freedesignfile is a great place to quickly find vector design elements and entire vector images, ready to be edited in Illustrator. All its images are free for personal use, and most can be used commercially. After a properly retro look and feel for your work? 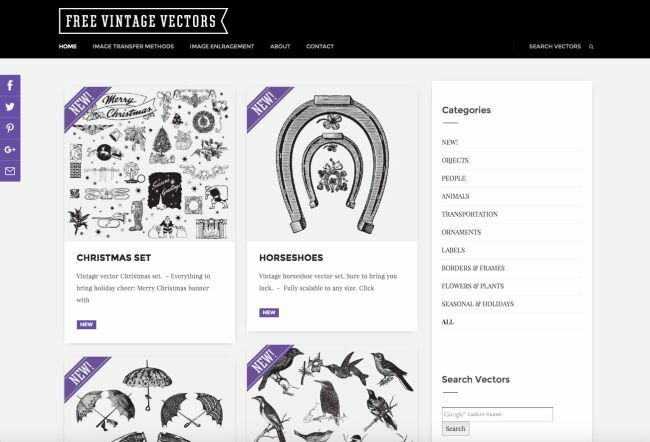 Free Vintage Vectors is well worth checking out; it sources vintage illustrations from antique catalogues, books and magazines, then carefully vectorises them and makes available as PDFs for free download. The selection isn't enormous, but it features a great range of imagery regardless. Boasting over 9,000 brand logos and more than 3,000 brand icons, BrandEPS is a great place to go if you need a logo in a hurry; its free downloads include files in SVG format, as well as JPG and PNG if you're not fussy about scaling. It's easy to search and if you're not really sure what you're after you can also browse the latest arrivals. The collection at Vector4Free isn't huge – at just over 1,500 free vectors it's much smaller than many of the other sites featured here – but the quality is pretty consistent and everything is well tagged so it's easy to find what you're looking for. All the featured vector images are free for personal use, but check before using them commercially. The team behind Vector.Me couldn't find a search engine for free vectors with a complete collection and flexible searching capabilities, so they decided to build their own. It's absolutely packed with over 280,000 vectors, and there are separate logo and icon sections in case that's all you're after. Freepik calls itself the "leading search engine of free vector designs". Created to help you find free vector art, illustrations, icons, PSD and photos for use in your designs, Freepik produces hundreds of free vectors daily. In total, it offers over one million free vectors and photos, which can be downloaded in AI, EPS or SVG format. FlatIcon boasts over 107,150 free vector icons. Its database is packed with free icons available in PNG, SVG, EPS, PSD and BASE 64 formats, so whatever type of vector icon you're looking for, you're likely to find it here. Fudgegraphics is a creative blog run by designer Franz Jeitz so it doesn't have a huge selection of freebies like most vector stock sites. However, everything here is made to a high quality, including one of the best free splatter vector files available online, so it's definitely worth including in your search for free vector art. FreeVectors.net is a fun community of vector-lovers who share free vector graphics. The most recently added vectors are displayed at the top of the page, and all are free for personal use (with most of them free for commercial use too). The team at 1001FreeDownloads scour the web for the best free graphics for designers. With thousands of free vectors alongside photos, brushes, gradients, PSDs, fonts and more – as well as high-quality graphics produced in-house – it won't take you long to find the vector you want. That means you can use DryIcons' icons, vector graphics and web templates in any publicly accessible website, web application or any form of publicly accessible presentation, according to some basic terms and conditions – which you'll find on the site. A nice clean site with lots of great free vector art. The blog-style layout is a bit time consuming to browse but you can find a lot of gems including excellent city vector shapes for New York, Paris, London, Moscow and Tokyo. Vectorportal contains a wealth of free vector art, which designers can use in both personal and commercial projects. Easy to navigate, you can filter your search using the drop down category box or search bar. With an extensive library of artwork, you're sure to find something of use here. One of the largest artist communities on the web, DeviantArt is full of free and useful resources, including vectors. However, finding exactly what you're after in the crowd of chaos can be tricky. The search bar and Resources and Stock Images link will narrow things down for you, and no doubt you'll come across lots of free vector goodies. Dingbat Fonts are essentially a collection of small vector illustrations. Simply type the letter you need and 'Create Outlines' in Illustrator CS6 to turn it into an object. 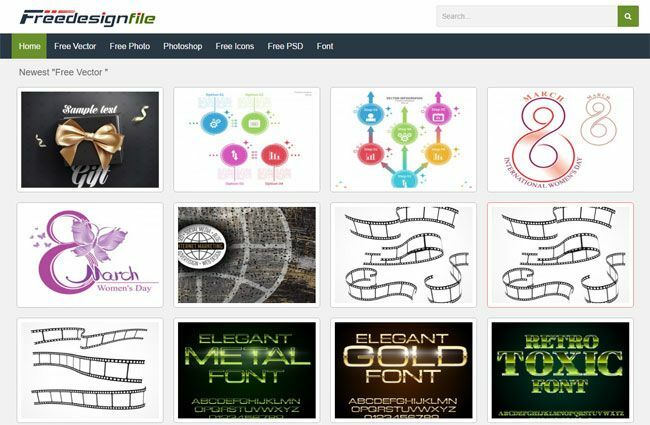 Not all fonts are free for commercial use, so check the right filters before searching. Font websites are generally more user-friendly and pleasant to browse than the ad-laden free vector art homepages. FontSpace in particular has a great user experience where you can see whether a font is free for commercial use simply by moving your mouse over it. 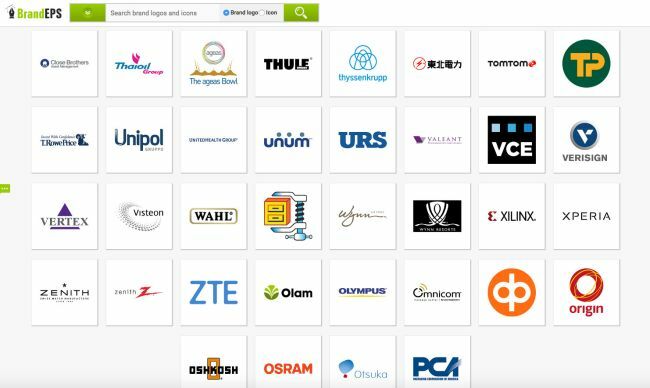 Brands of the World is an invaluable timesaver if you're designing for corporate clients and don't want to sit around waiting for someone to forward you a hi-res version of a certain logo. You can just find it here. This personal blog belonging to designer Chris Spooner features a large number of well-made, original freebies. Come for the free vector art, stay for the excellent and insightful articles! Popular site Vecteezy is a one-stop shop for any free vector art you can think of. However the quality does vary, so you may have to spend time wading through mediocre vectors before finding something that is good enough to use. It's worth the time though, because there are some quality vector graphics to be found here. DesignContest is more of a commission site and extremely tricky to navigate if you're just looking for free vector art. However, it does offer a well-designed free T-shirt template and various other free icons on the lower-right menu. A big stock vector site with very efficient browsing options. You can search by colour, theme, popularity or file extension. It's clean to navigate and free from distracting ads. All in all, a superb place to search for free vector art. Despite being heavy on adverts, All Silhouettes trumps many other free vector art websites in that everything is clearly labelled, fairly quick to navigate and the vast selection is available as bumper vector packs rather than single images. VectorStock's main business is a library of reasonably-priced vector imagery, but as a handy aside it also boasts a substantial collection of free vectors. They're all available in EPS format, and it's nice and easy to create an account and start downloading. With, by our reckoning, over 16,000 free vector sets available to download, you're in with a pretty good chance of finding what you want at Free Vector. To make life easier there's a good selection of categories to choose from, plus a pretty sweet collection of company logos.